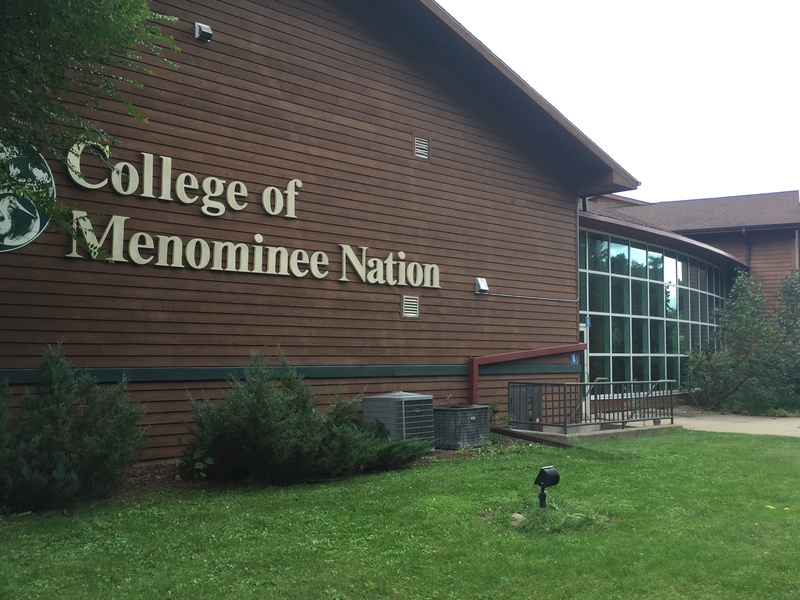 The Wisconsin Indian Education Association welcomes you! 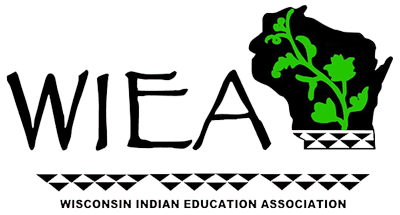 The Wisconsin Indian Education Association (WIEA) was established in 1985 by a group of concerned Indian Educators to carry on the efforts of the former Great Lakes Inter-Tribal Council (GLITC) Education sub-committee. The GLITC Education Committee began in the early 1970’s but was disbanded around 1983 because of a lack of funds. A group of concerned Indian Educators began meeting in 1984 and after a series of meetings during that year, developed By-laws and a mission statement. 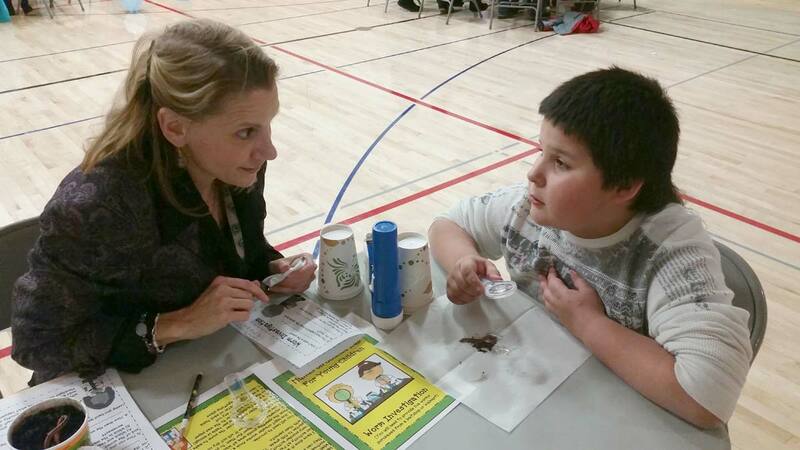 The group was formally organized in 1985 as the Wisconsin Indian Education Association. The Association has seven regions throughout the State. Each region elects/appoints two representatives as WIEA Board members for a two-year term. Each Region’s Board members are responsible for hosting a meeting in their region throughout the year to share and gather information for the Board to either act upon or disseminate to all other WIEA members. The Board meets every month except December. Meetings are held in the various regions throughout the state in an effort to get input from the general membership regarding their issues and concerns. 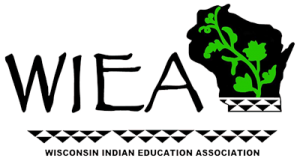 Welcome to the Wisconsin Indian Education Association’s website! Here you will find a plethora of information and resources on Native American Indian Education. First things first – some simple “Indian” (Native American) rules of etiquette: We do not pass judgement. We all experience the ups and downs of life, and the best way to make all of our lives better is through compassion and tolerance. Secondly – the terms “Native American,” “Indian,” “Indigenous,” “Native,” “Tribal” and “American Indian” are most always interchangeable. In today’s progressive world, it’s good to know the most acceptable and respectful way to address each other. Third – all Indians are NOT the same. Each tribe, each community, even each family, may have a unique set of values, traditions and customs that guide their beliefs and systems. Although we do share many great things among our tribal cultures, each tribe (or band) has specific customs and beliefs that shape their collective tribal culture. We have a mixture of tribal affiliations and cultures here in Wisconsin but for the most part, the tribes indigenous to the state are Woodland People. A common misconception is that all Indians lived in teepees. Not so. The Sioux (Lakota/Dakota) people lived in teepees, which are indicative of the Plains Cultures (the Sioux moved to the plains from the woodlands, where they once lived). These dwellings were conical and made of long tree poles and buffalo hides. For the most part, Woodland People such as the Ojibwe, Potawatomi, Ho-Chunk and Oneida lived in dome shaped dwellings, of which the frames were constructed of saplings and covered with the wood, bark or fiber of local trees (and some tribes even used animal hides as coverings). As Indian people, we respect and honor each other’s customs and beliefs, and in that, we are bound by more similarities than differences. Fourth – there are 11 federally recognized tribal nations living today in Wisconsin and one nation that is still pursing federal recognition. They are the Ho-Chunk, Ojibwe/Chippewa (which consist of six separate bands; Red Cliff, Bad River, Sokaogon (Mole Lake), St. Croix, Lac du Flambeau and the Lac Courte Oreilles), Menominee Indian Tribe, Potawatomi (Forest County), Stockbridge-Munsee Band of Mohican Indians, Oneida Tribe of Indians and Brothertown Indians. Fifth – if a Native person offers you something to eat or drink, please kindly accept. This is a long held tradition among American Indians and a great sign of respect when accepted. Our communities are often the largest employers in the counties in which they are located and provide jobs, critical infrastructure services and resources to both Indian and non-Indian people. One popular belief is that all Indians have casinos and therefore are “rich.” While we are certainly rich in our culture and heritage, our gaming revenues are largely funneled back into our communities to support tribal government and those critical infrastructure services previously mentioned. Our communities often have unmet needs, which create special challenges for our people. As Indian people, we hold dear to our traditional ways while trying to balance the progress of 21st century living. In today’s world, we as tribal nations believe in providing the best opportunities for our children, young adults, working and single families, professionals and our elders. This includes education and the ability to pursue the “American Dream.” Our mission at WIEA is to advocate for the advancement of our tribal members and descendants through legislation, political avenues and legal approaches with education at the heart of our effort. I hope you take your time looking around our website and are open to learning about our organization and the people we serve. I guarantee with you’ll be pleasantly surprised with how rich and colorful our culture and people are. “We are proud of the 2019 class of WIEA Award recipients and honored to have individuals such as these, as leaders within their respective communities and organizations,” said Brian Jackson, WIEA President. 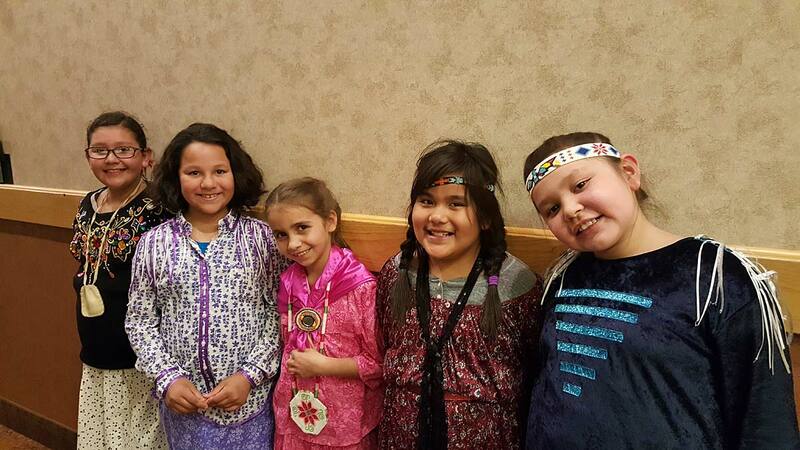 “They exemplify the best of Indian education across the 12 Tribal Nations and state of Wisconsin,” Jackson added. 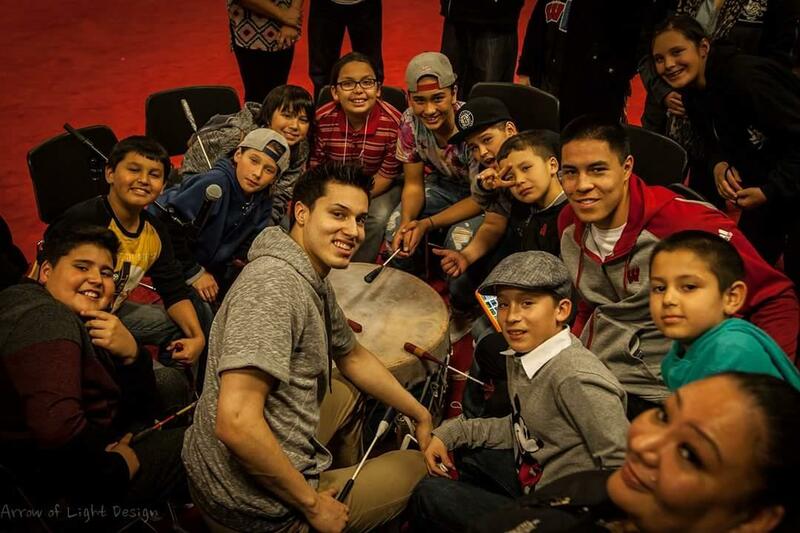 The annual WIEA Award nominations are open to American Indian and Alaskan Native students, educators, elders and parents living in Wisconsin. Award recipients are determined by an awards selection committee comprised of WIEA members, with the awards presented at an awards banquet and ceremonies held during the annual WIEA conference. This year the Awards Banquet will be held on Saturday, April 27, 2019, from 6 – 8pm at the Hotel Mead and Conference Center in Wisconsin Rapids, WI. The Wisconsin Indian Education Association would like to thank all those who took the time to nominate individuals for the annual awards. Likewise, we congratulate all of the award winners and honorable mentions for their continued success in strengthening Indian Education. The Wisconsin Indian Education Association has announced that the 2019 conference will be held on April 26 & 27, 2019, at the Mead Hotel & Convention Center in Wisconsin Rapids. 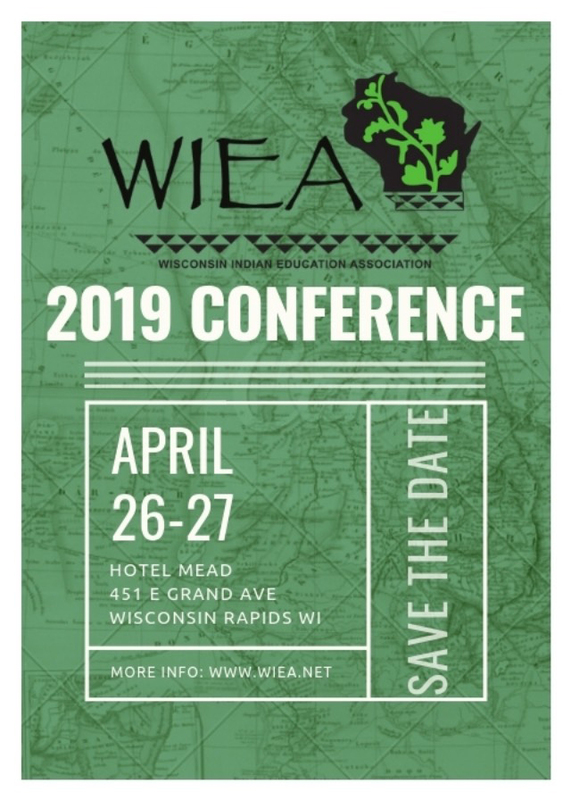 The 2019 conference will be hosted by WIEA’s West Region. Watch for news and information on this and more in the near future! Great Lakes Inter-Tribal Council, in partnership with multiple groups interested in the health of American Indian people, has designed a student development program to support students who are interested in health care research and occupations. 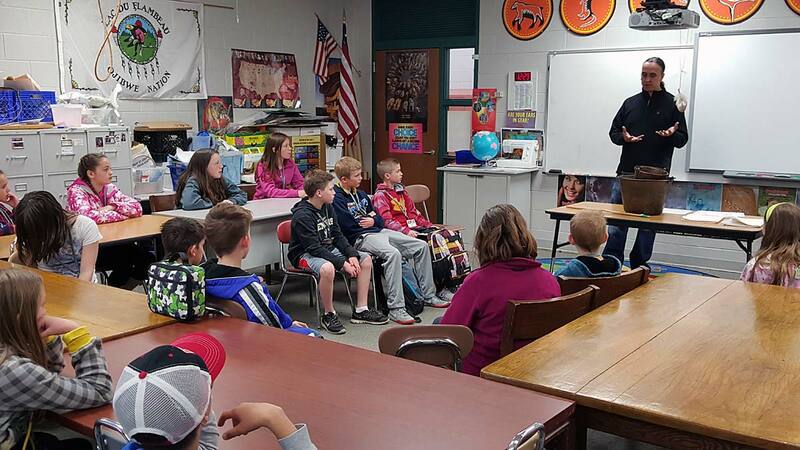 Through this program, students are provided with academic support, career guidance, and opportunities for hands-on learning experiences from middle school through their Bachelor Degree. 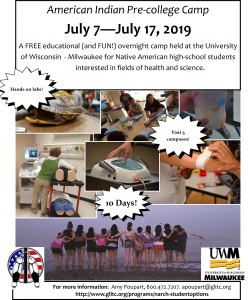 The camp runs from July 7 – 17, 2018, in Milwaukee at the University of Milwaukee-Wisconsin. Click the link below for more information and click here for the Camp Flyer! Click here for more information on the GLITC website. Thank you for a successful 2018 Conference! 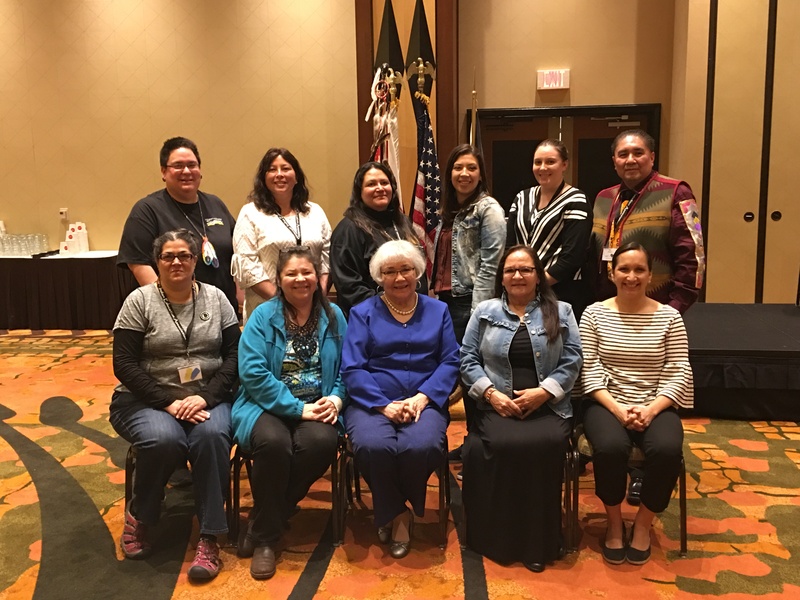 The Wisconsin Indian Education Association and the East Region sincerely thanks all who attended and participated at the 2018 WIEA Conference! 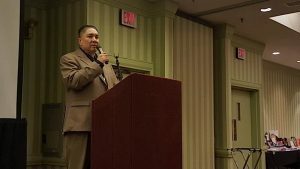 The 2018 conference titled, “Revitalizing Tribal Nations Through Community Engagement“, was held April 19, 20 & 21 at the Menominee Casino Resort in Keshena, Wisconsin. 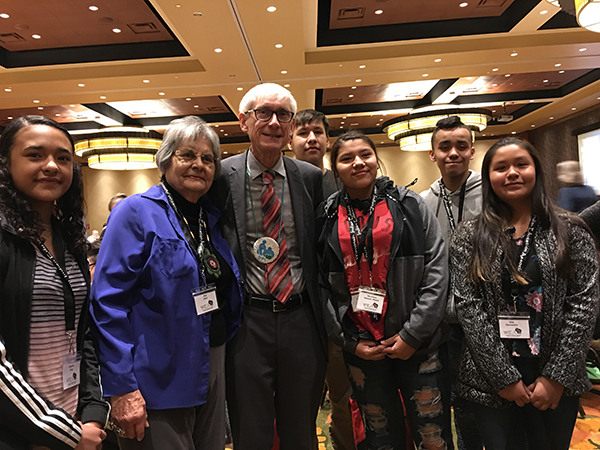 With over 40 workshops, presentations and keynotes, the conference was an all-star gathering of education professionals, tribal leaders, legislators, community partners and parents and students. We sincerely thank all of our sponsors and participants for your unyielding support! Planning is now underway for the 2019 conference. Our annual Act 31 Celebration date and location has been announced! 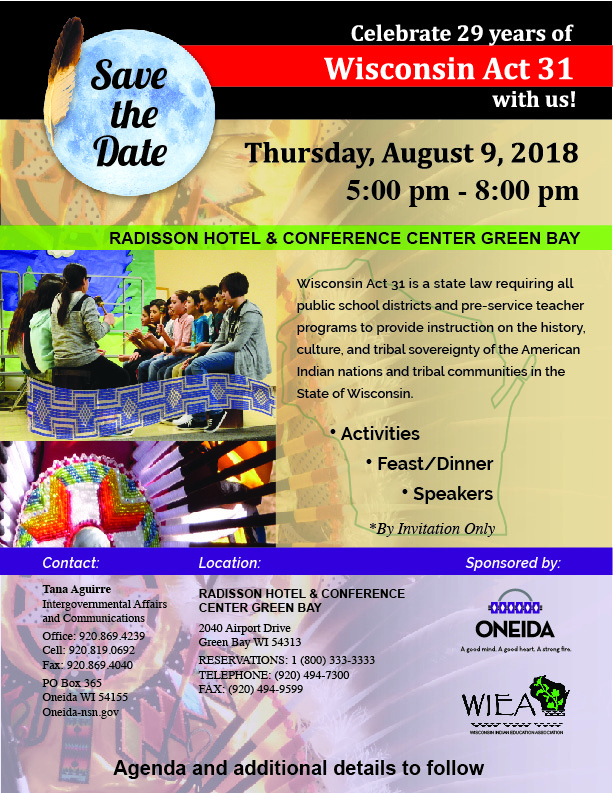 This year’s celebration will be hosted by the Oneida Nation and will be held on August 9th at the Radisson Hotel and Conference Center in Green Bay. For email, please use form.